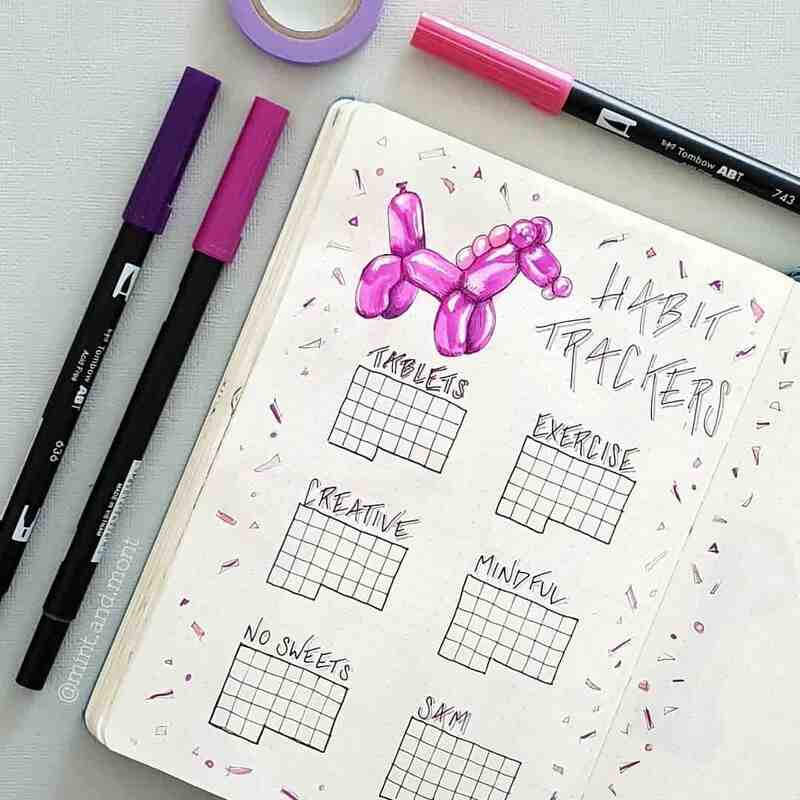 This bullet journal habit tracker article will outline everything you need to know about habit trackers and how to go about using them to help you succeed in various areas of your life. Chances are you’re tired of going around in circles trying to form good, healthy habits. Indeed, habit formation takes a long time and a lot of dedication and this exactly why you need bujo habit trackers…or a few. Every day we unconsciously (or consciously) perform millions of little routines that ultimately become our daily habits. Unfortunately, many of these are bad and need to be addressed. But how do you address them? Generally, we’re always thinking about how much better life would be if we made better choices, but it seems so hard to do a 180 and build better habits. So, we’re always stuck thinking things like, if only I could go to the gym every day, I would look great in my clothes and feel more confident when I’m in public. Or, if only I could turn off the television at exactly 10 pm, I would be able to wake up early and have a more productive day. But have you been able to effectively do any of these for the long term thus far? I’m guessing the answer is no. It is very important to take control of our days and ultimately our lives. This is why habit trackers are an amazing tool, as they allow us to become more mindful and start this journey of taking back control of our lives, one good habit at a time. Imagine being able to accomplish your goals, keep track of the things you’re doing every day and shifting those bad habits to more positive, healthy habits that positively impact all areas of your life? 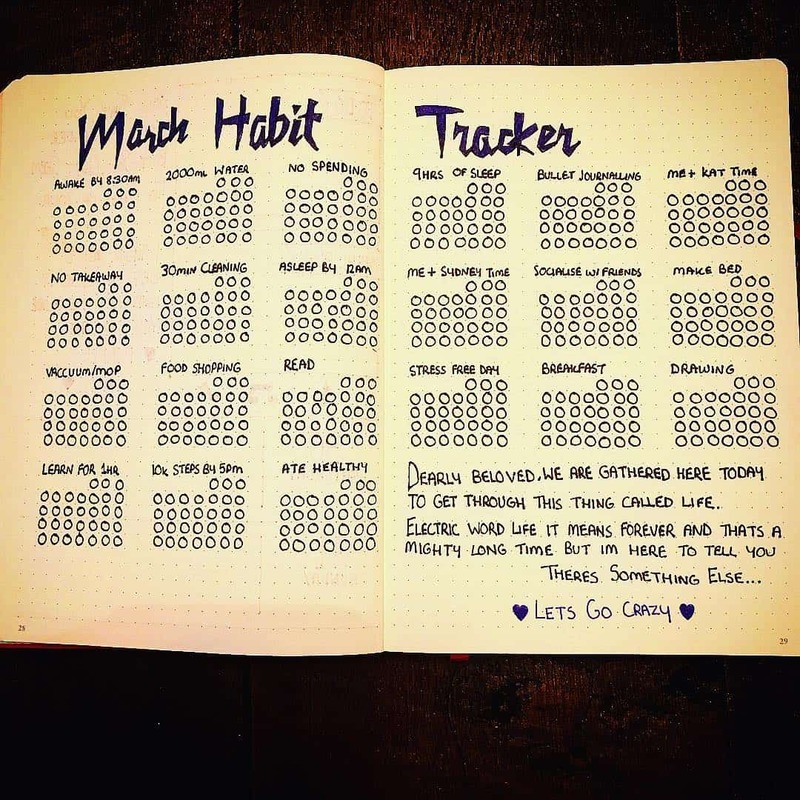 You can do all this with habit trackers! 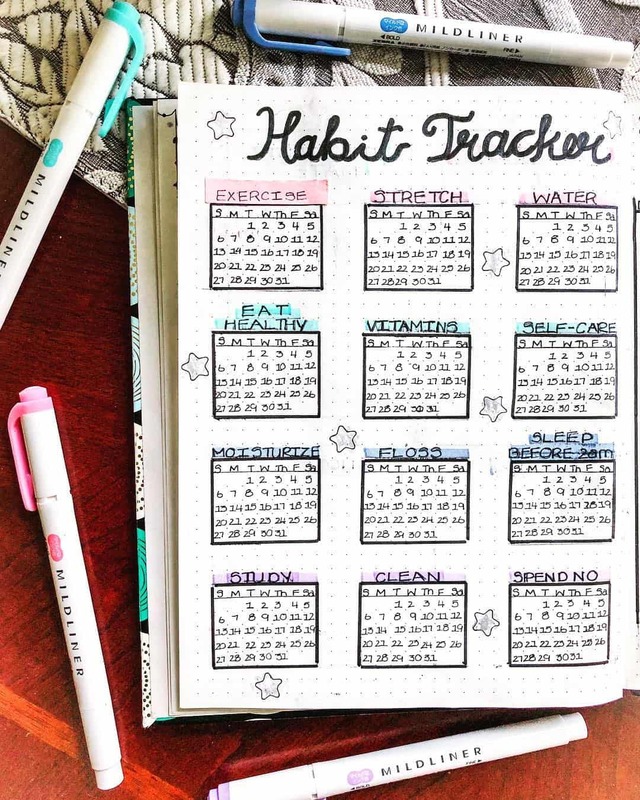 A habit tracker is a chart that you can use to help you build stronger habits over time. In a bullet journal, it is a simple page (or a group of pages) where you keep account of certain areas in your life you want to improve over a certain period of time. It is an amazing tool to use as it is effective and helping people achieve goals. 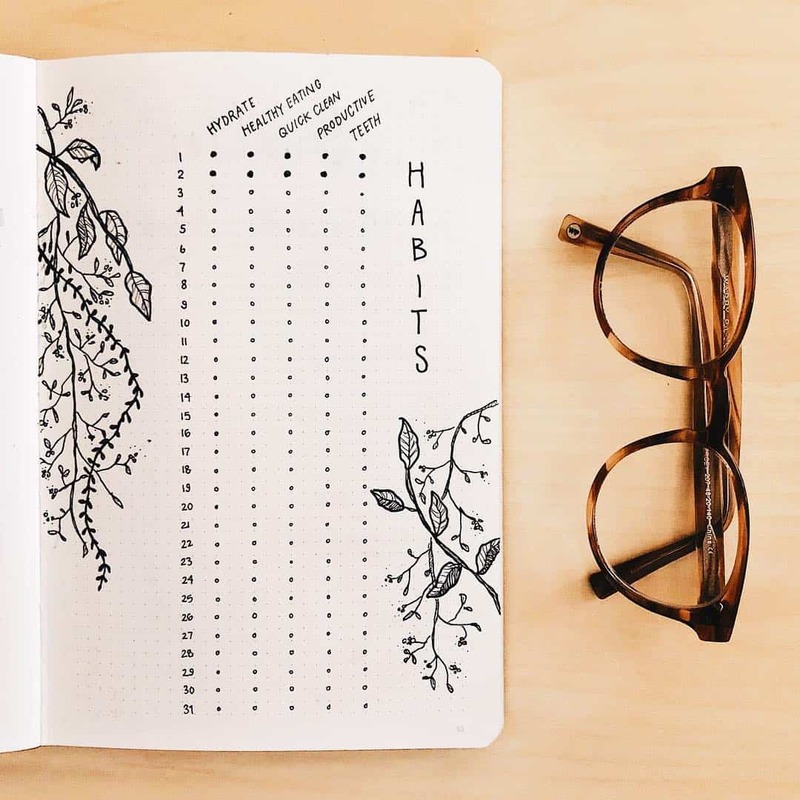 If you’ve been considering the idea of using a habit tracker in your bullet journal, then you should be able to learn everything you need here to get started and set up your own bullet journal habit tracker. There are numerous reasons why habit tracking is a powerful practice. The list below shares three of the most important reasons why habit tracking is important. It is motivating to see the progress you are making and many times on tough days you keep up with your habits out of the determination to not break your streak. Habit tracking is very satisfying. you feel good every time you record your success. Just imagine how good it will feel and how much further you will be in so many areas of your life just by starting to use a habit tracker every day. Habit tracking increases productivity – Are you currently struggling with being productive? A habit tracker can help you get more productive in various areas of your life you find that you are lacking productivity in. How? A habit tracker is meant to help keep you inspired and motivated to get things done. The mere fact that you have to have to record your actions daily make it so that you’re instantly always reminded of what needs to be done which makes it more like to get done. So, if you feel like you haven’t been keeping up with chores or business tasks, or work, or just about any other thing in your life that you want to be improved, track these habits and see how quickly your productivity skyrockets. Help you see patterns and correlations – Many times we aren’t aware of what causes certain things to happen in our lives simply because there is no real system of tracking things in our everyday lives. For instance, without using a habit tracker, you may never be aware that in general, you only get 2 glasses of water every day when you really should be getting 8. So, if you’ve not been keeping up with your water intake, the next time you feel ill, you can go through your habit tracker and find the correlation there. Then, you will understand exactly why you’re not feeling too good. In the case of this example, a water consumption habit tracker is a great choice for you. It helps promote success – If something is tracked and there is a visual representation of its progress, regardless of how big or small, the chances of that thing becoming a success is heightened. This is why people get extra motivated when they get on a scale and realize that they’ve lost their first 10 pounds. This is why habit tackers promote an environment of success for any habit that you’re tracking. As times goes by and you start to see the benefits (physical or mental) that you receive from trying to build this good habit, you can’t help but continue with it. It creates personal accountability – Nothing makes you feel worse than not being able to shade that little square. Therefore, this creates a feeling of accountability and that propels you to continue doing what you should be doing every day. I’ve known people who refuse to go to sleep unless they’ve completed and tracked their habits for the day! It creates a sense of satisfaction – Who doesn’t love that feeling of checking off that box knowing fully well that you’ve done it yet again. This makes you feel so proud. It creates confidence – Every time you see how far you’ve come, you’re guaranteed to feel more confident in your self and your ability to keep it up for so long. Helps keep you on track – It’s very easy to fall off track when you’re trying to build healthy habits. However, with a habit tracker, it becomes a bit easier for you. If you see that you can make it through the first week or the first two weeks of something, this gives you the motivation that you can also make it through the next 2 weeks and so on and so forth. 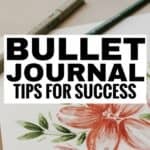 There are hundreds of things that you can keep track of in a bullet journal. Here is a list of the ones that seem to be more popular. Remember, you do not need to track everything that is listed below. 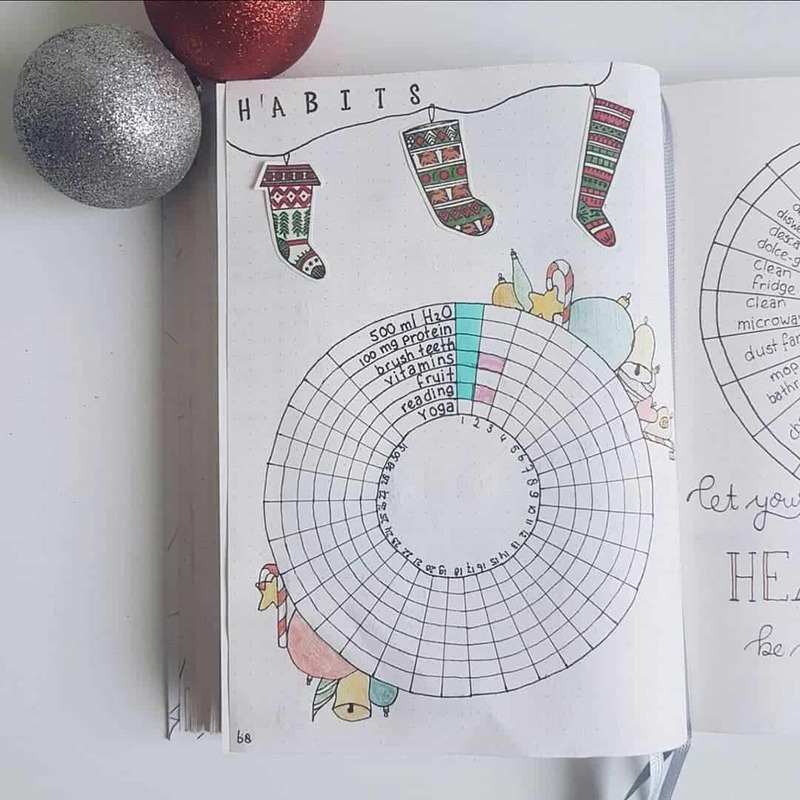 Instead, just pick a handful of habits that you really want to work on this year and add them to your habit tracker template and be on your way to developing healthy habits with your bujo (I will show you how to do this below). No soda, junk food, coffee, alcohol, takeout etc. There are so many ways you can set up your trackers. 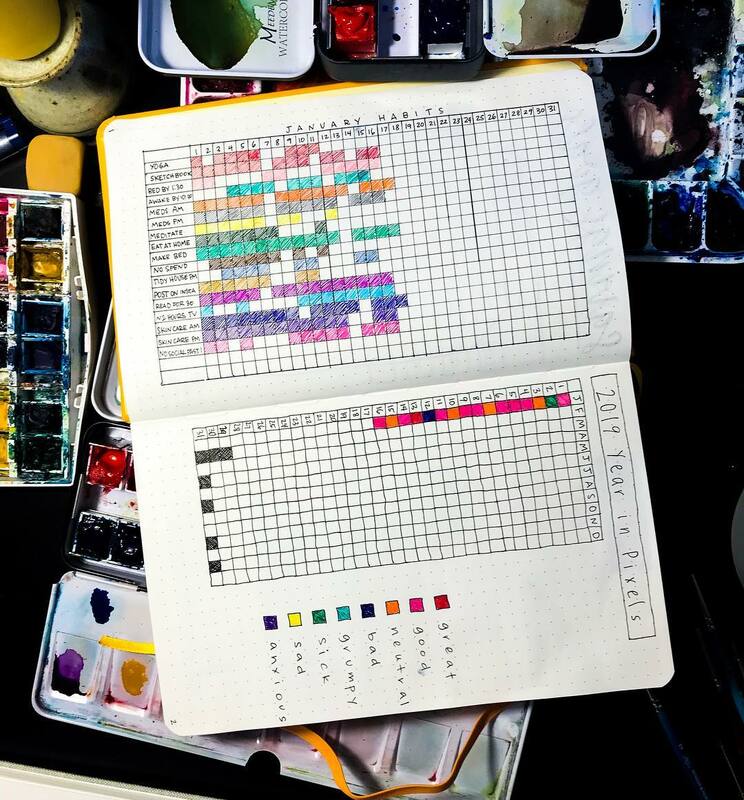 Here is a list of beautiful bullet journal trackers that you can use as inspiration for your own trackers below. Now that you’ve learned how beneficial habit trackers are, you’ve learned of over 100 things you can track with a habit tracker and you’ve seen some wonderful inspirations for your own tracker, it’s time for you to of the various ways you can use your tracker. There are two main habit tracker layouts you can try out. They are the weekly tracker and the monthly tracker. Depending on how you like things organized either or both may suit your needs. You can continue reading to find out the benefits of both. Of course, depending on what you’re tracking, a monthly or a weekly may be handier. For example, if you’re tracking things like steps, water consumption, medication, weeklies may be more appropriate as you don’t really need to see trends for this. On the other hand, if you’re tracking things like weight, mood, sleep these may be more suited to a monthly habit tracker. Forget easily and don’t want to slack off. Need to be kept accountable. Because you may be checking your weekly spread more than your monthly spread, you can be reminded to keep up your good habits. 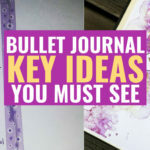 These can be easily added to your bullet journal daily spreads. They’re ideal for you if you like to track things on your daily spread for convenience. Do you prefer to track every single day of the year on one single spread? if so, you’ll need a yearly habit tracker. 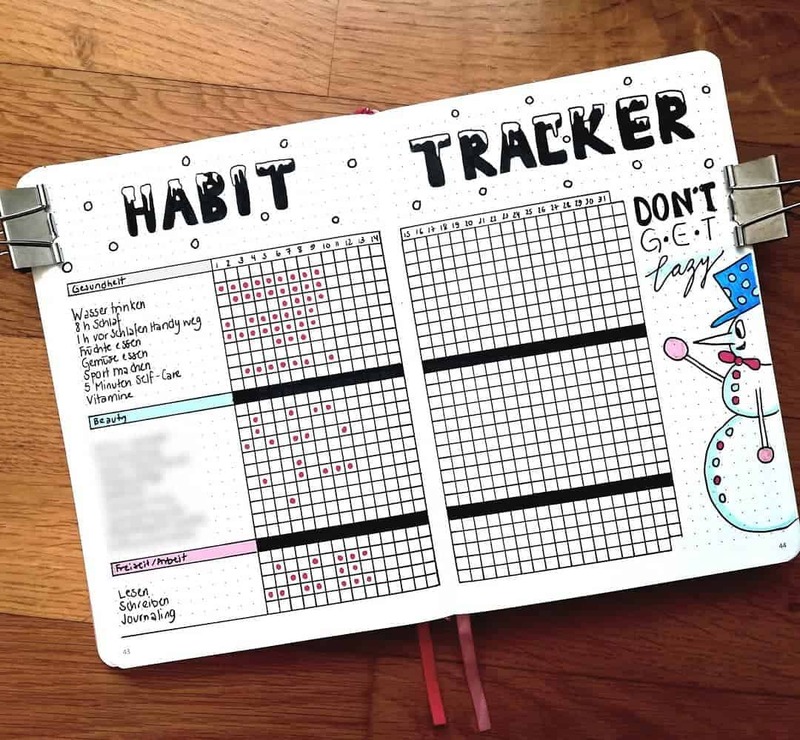 Now that you have gone through everything you need to know about habit trackers, it is time for you to set your own habit tracker up. 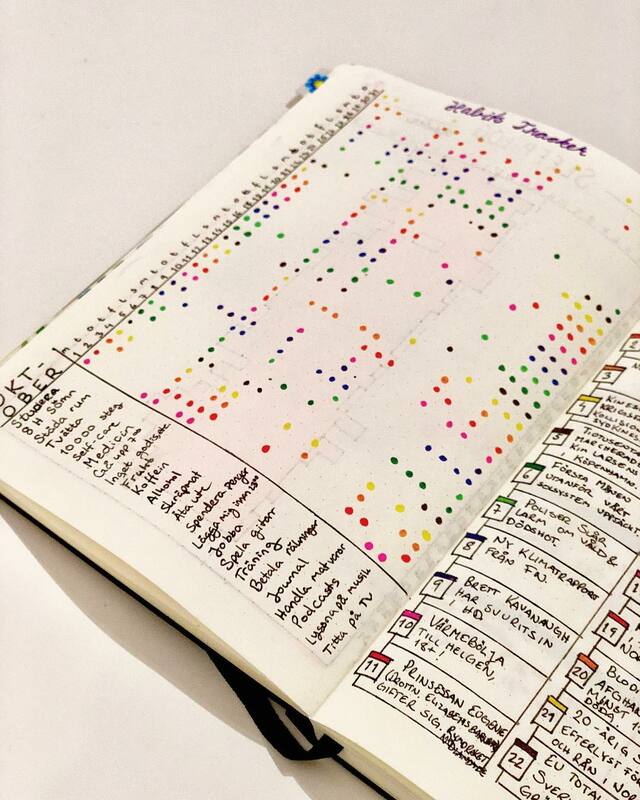 To do this, you will need a bullet journal – preferably the Leuchtturm because the dot grid makes it easy to draw out your chart – a ruler. 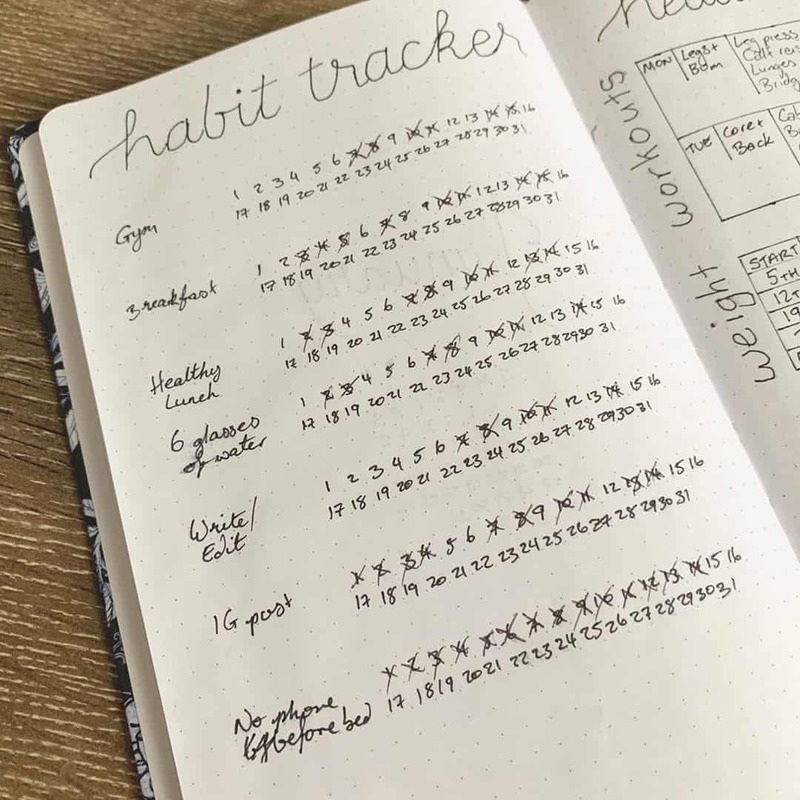 Then, you will outline your habit tracker chart in your bullet journal – keeping in mind whether you prefer a monthly, weekly, daily or yearly layout and how many habits you’re going to be tracking. That’s it! This shouldn’t take much time. You can also find a habit tracker printable that you like, print it out and glue it to your journal and you’ll be all set to starting building better habits. 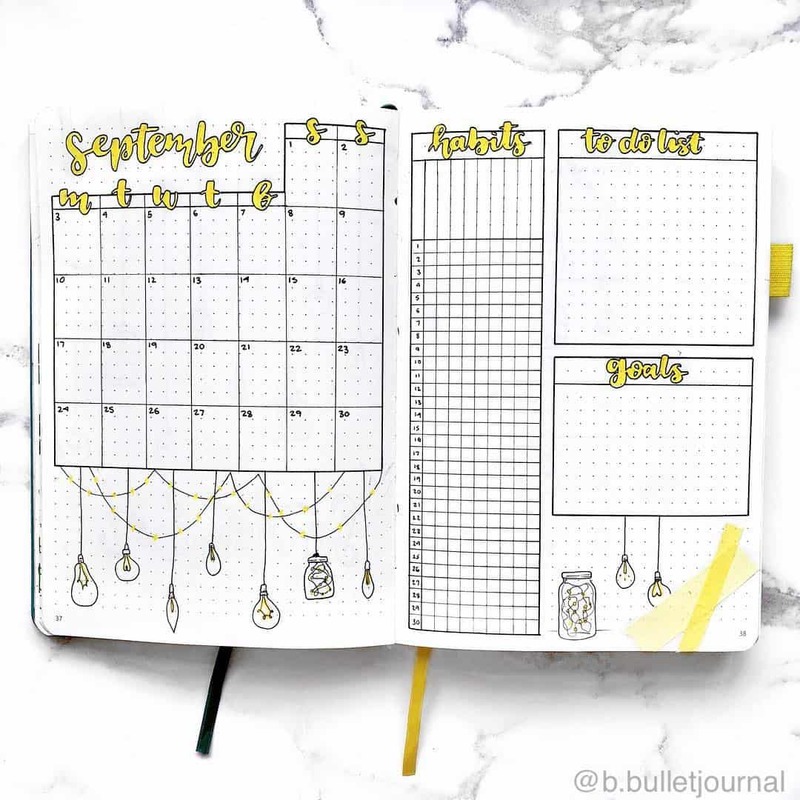 Do you prefer to use a habit tracker bullet journal printable to track your monthly habits? 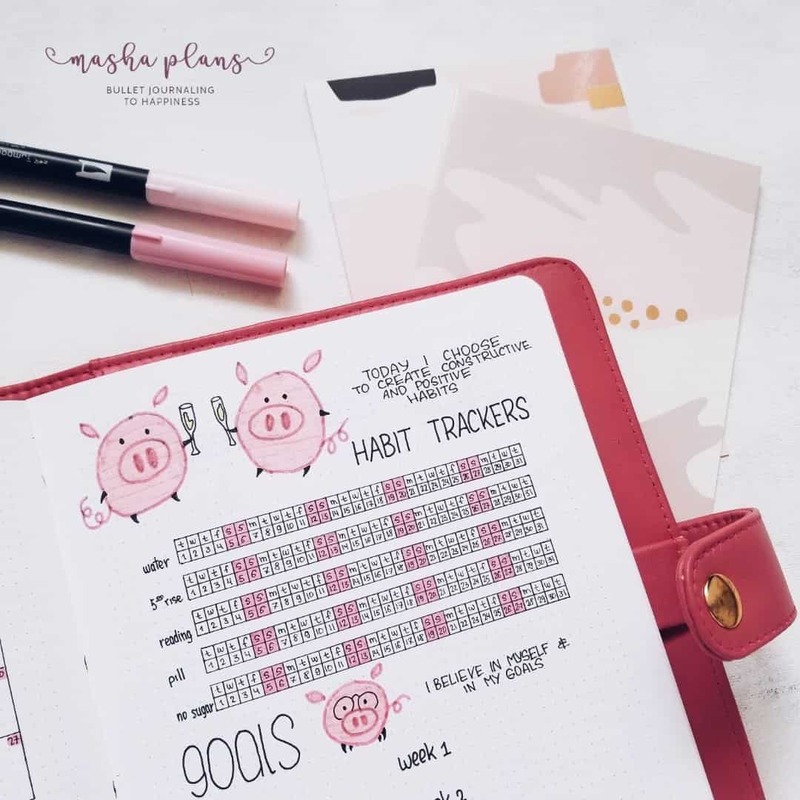 These simple habit tracker printables for your bullet journal can be easily printed and placed inside of your bullet journal so that you can easily track all your habits. 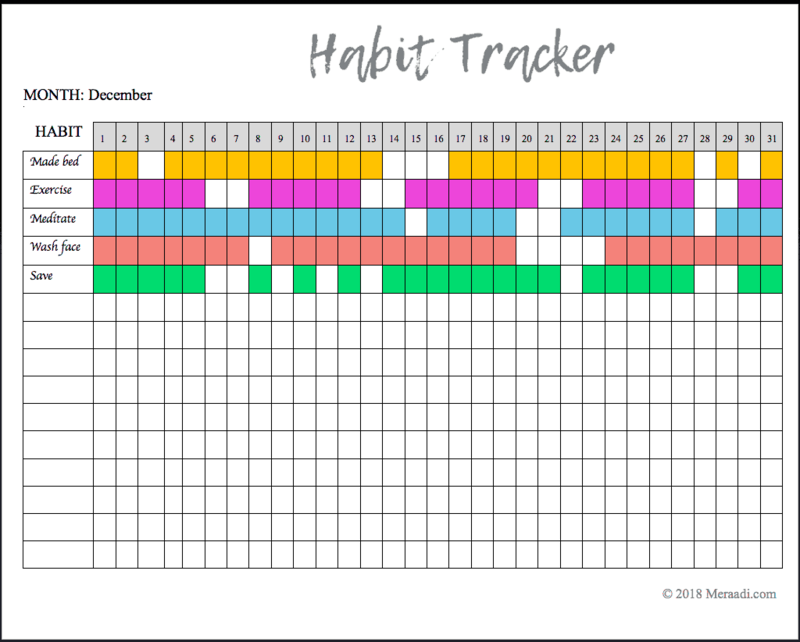 You can use this link to download the free pdf file and receive 4 habit tracker templates for free! 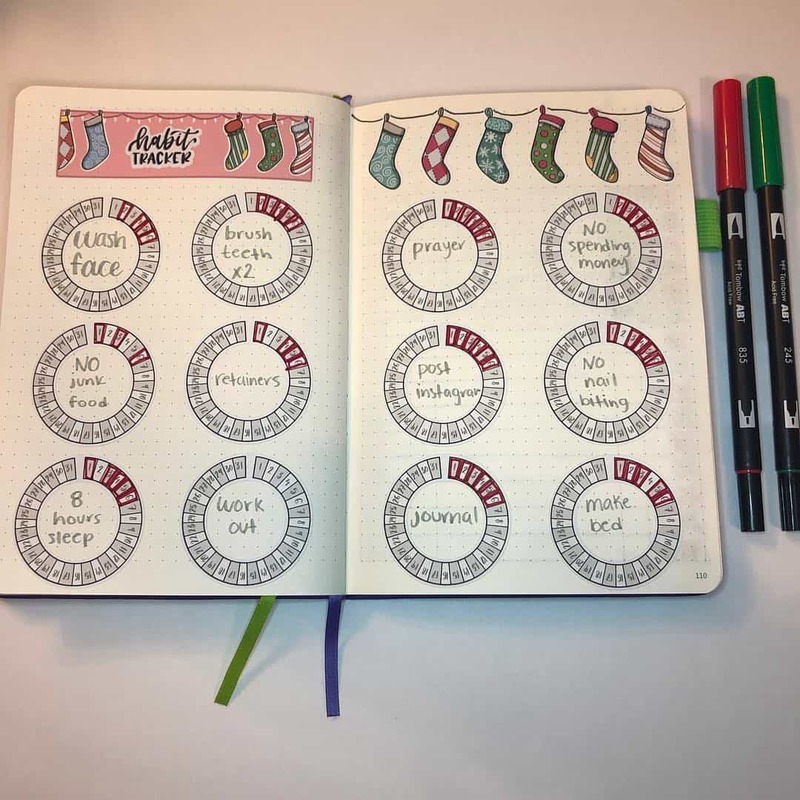 Here is an example of the printable habit tracker in action. No matter what you’re trying to fix right now, remember this, tracking your daily habits will help you keep track of what you do every day. That way, you’ll be able to see if you’re making progress with goals, keep an eye out for bad habits, and most importantly be more honest with your self. You see, many times we like to guesstimate, but with a habit tracker, you will be able to see exactly what you practice every day. How does this make you more productive over time? Well, every day, you be motivated to do more, or do better than the day before. Thus you will be working on these healthy habits you’re trying to build until they become engrained in your daily life seamlessly. Pretty soon, these habits that you’re tracking won’t even need to be tracked anymore. They will have become part of your everyday life. With this, you will feel and be more successful and more in control of your life at last!